Not sure if you guys have been through this, but have you guys ever wanted to just kick back at home after a long day at work, enjoying a scrumptious dinner without having to cook it, but always feeling too lazy to go out and buy it yourself? Or perhaps you are expecting some company over but always feel overwhelmed at having to cook for a large group but couldn't find the time to rush out to get some take-out? Well I myself have had too many of these type of days myself, especially seeing as how I am always so busy at work, and house chores are stopping me from finding food for myself or my guests. 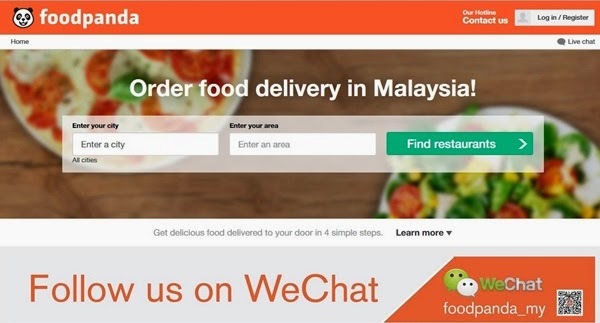 From Kuala Lumpur to Penang, from Petaling Jaya to Johor Bahru, make your life easier with food delivery in Malaysia! 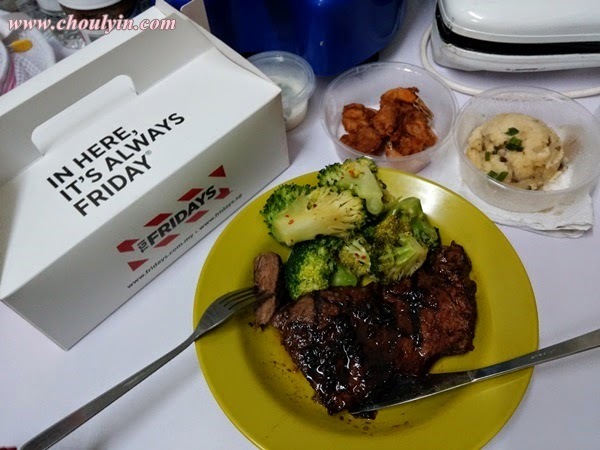 foodpanda is an online food delivery service that makes it easy for customers to order food from the best restaurants in Malaysia and get it delivered at their home. 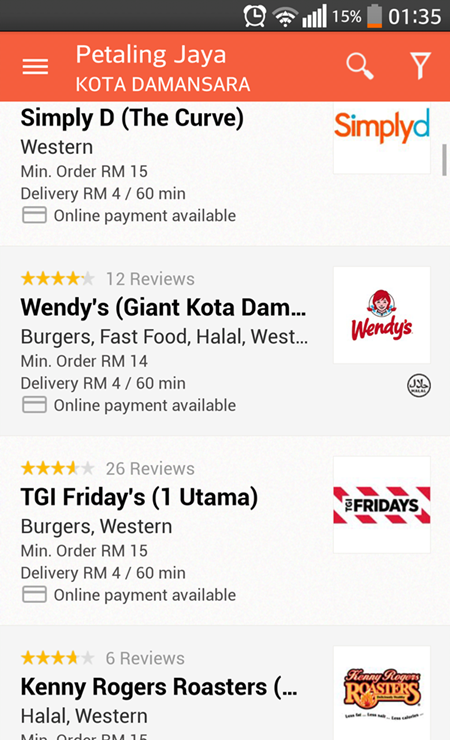 With more than 500 restaurants to choose from, foodpanda makes food delivery in Malaysia faster, easier and more convenient. Customers can order food from popular international chains like Tony Roma's, Kenny Rogers Roasters, Sushi King, Gongcha, A&W, Sakae Sushi, Italiannies, Simplyd and lots more or from the local favorites like Canadian Pizza, Kgb Killer Burgers, TGI Friday´s - The Gardens,Chatime, Pat Kin Pat Sun Cafe Southgate, Papa John´s KL, Ipoh, Melaka, Passage thru India, Suria KLCC, Living Food restaurant, Wendy´s Suria Klcc Mall, Subang Jaya , Kashmir Restaurant, Sushi King, Chatime Malaysia, Tang Shifu, etc. Still apprehensive? I know when I first heard of them, I was apprehensive too! I mean, how can a food delivery service provide such a comprhensive list of outlets? Truthfully, this is the first time I have come across a food delivery service that has that many selections. So then I decided to try it, and let me tell you a bit about my experience with FoodPanda. Your order chit is located on the right side of the screen, and this makes it easy for you to have a quick look at what you have ordered so far. I picked a day that I knew I would be home alone having a meal on my own, because sometimes you just need some alone time with a nice meal to unwind yes? 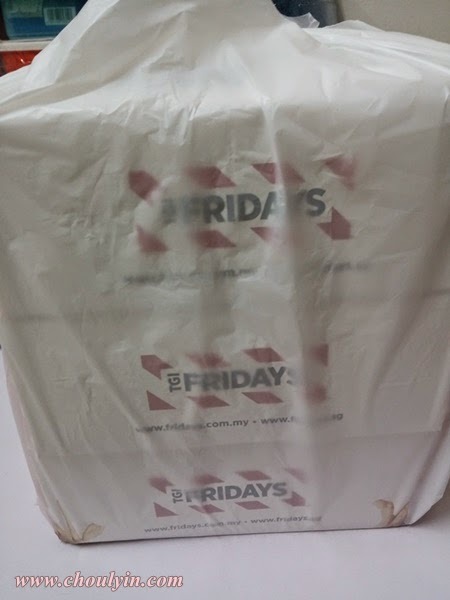 So then I took some time out during my lunchtime to browse through FoodPanda's website, and decided to get myself some TGI Fridays. Now, FoodPanda doesn't only offer delivery of foods within the hour, they also let you preorder your meals, so you can order any time of the day, and have it delivered to you any time you wish to. I set my delivery to 8pm that night, just in time to receive dinner after I have arrived home and bathed. Once you have completed your order, you will be brought to a final review page where you will be informed of your final price after including taxes. The ordering process was quite straightforward. You select your location, and then they will display to you a list of available restaurants and food outlets in that area that can deliver to you. Then, you click on the restaurant of your choice, and the whole menu that's available to order for delivery is displayed. It's a pretty simple procedure, and the system is very responsive, making it easy for me to order what I wanted. 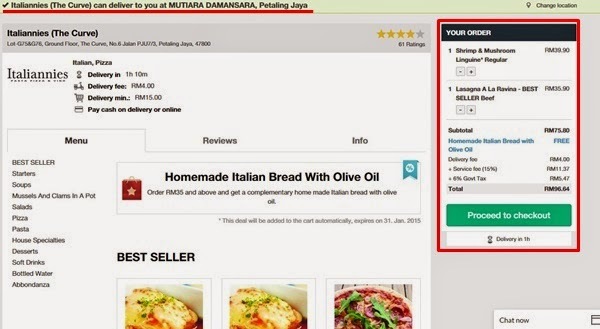 Some restaurants offer free delivery while others will charge a small token sum. Just so happens when I ordered, it was the Christmas week and some restaurants waived their delivery cost. After I've placed my order, there's nothing else to do except sit and wait for it to arrive. And true to form, at 8pm (or about 10 mins past 8), there was a knock at the door, and my food had arrived! They got everything in my order right, and the steak was also cooked as specified! 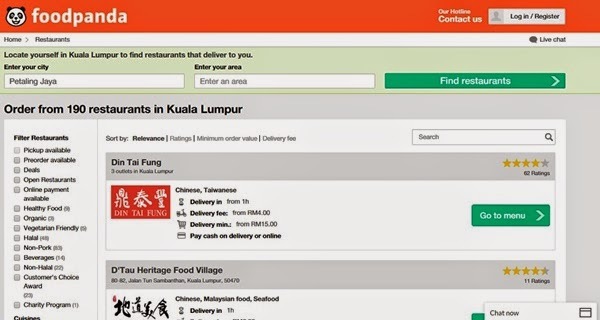 Truthfully I never thought that FoodPanda will be able to pull off so successfully a business model such as this. I was very pleasantly surprised. Based on my experience, I would definitely recommend this to everyone. And if you don't have a laptop with you at the moment, don't fret. They also have the FoodPanda app that you can access on your Apple or Android device. 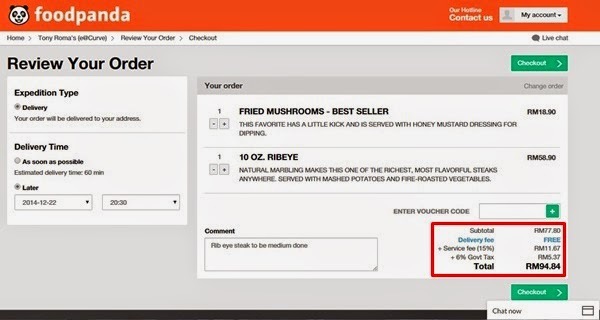 Methods of ordering are also the same, just select your restaurant and order your food in four simple steps! Given the holiday party example, Ms. Utz said, “You have to look at the role of the person. If the role of that person is to be there and be responsible for children air jordan shoes australia and interact directly with children, then I think that applies.” While some districts have considered whether a teacher was in the classroom for determining the need for clearances, Ms. Utz said the key is the role of the visitor or volunteer, air jordan australia not whether a teacher is present. She said parents picking up children at day care centers don’t need background checks even though they may interact with other children.